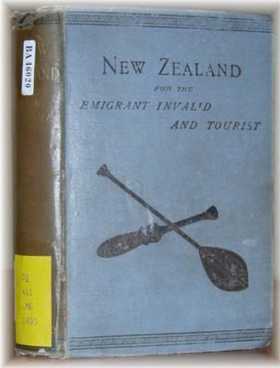 New Zealand for emigrant, invalid and tourist (1890) despite its title is in reality a tourist’s handbook for travellers to New Zealand. Such books provide useful background and information about places at a specific point in time. This can prove of value to historians in developing background to fill in gaps in data. The book addresses the need for the British to emigrate and why New Zealand should be considered. It examines the climate, including the North Island volcanoes and discusses the Maori race before addressing individual locations; Auckland, Waiwera, Ta Aroha, and Rotorua. The book looks at how the country is administered, produce and industry, and the social strata of the people. It closes, pointing out the advantages to the emigrant doctor or dentist by examining the common ailments of the nation! Significant statistics are listed throughout such as the mean annual rainfall, the lunacy rate and mutton exports for 1888. The book contains a number of historic maps including the whole country, Auckland, the Hot Lake District, the West Coast Sounds, and the Taupo Volcanic Zone. Old historical records are a valuable resource for local, family and social historians as well as for researchers in other fields of history. If you're exploring your family history or building a family tree, this index is a must.